Born 1937 (d. 1996) Carter County lived in Morehead, Kentucky. We met Larry Hamm on the occasion of the first annual "Day in the Country" in 1994. At that time, he was creating constructions that included farm scenes with small barns and miniature pigs and piglets as well as similarly styled constructions of log cabins and Noah's Arks. We were most interested in his figural work which to our knowledge were carved portraits of the U.S. Presidents. 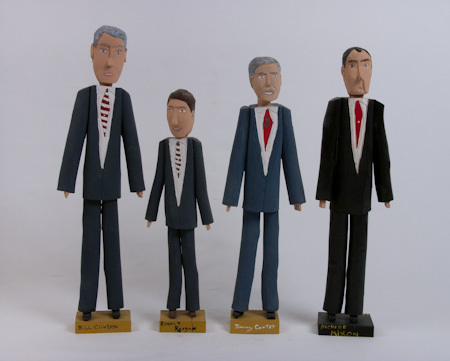 Over the years, we collected his Jimmy Carter, Bill Clinton, Richard Nixon, and Ronald Reagan figures. Our favorite piece of Larry Hamm's work is an Elvis cane. It is Elvis in his Las Vegas period. His ivory colored jump suit is open exposing most of his chest. There is added golden yellow paint that embellishes the jumpsuit and necklace for added bling. Sadly, Larry Hamm died suddenly of a heart attack in 1996. His work shows up infrequently at auctions but is displayed in the permanent collection of the Kentucky Folk Art Center, Morehead, Kentucky.